Old chucks don’t have to be dumped in your closet. Use the tips in this article to give them new life. 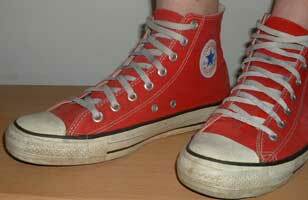 Sooner or later, every chucks wearer has to retire a pair that have been worn for a long time. It could be because the inner sole is deterioring, or the outsoles are wearing thin, or because the canvas uppers are wearing out on the inside. But there still can be some life left in your old pair of chucks. This article gives you some tips and suggestions on how to preserve them for additional wear. Shoe inserts will give these chucks a lot of additional life. 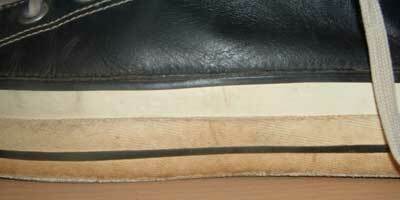 If the inner soles have started to deteriorate, they will be uncomfortable to wear and make a mess on your socks. But if you get a pair of shoe inserts, like the kind made by Dr. Scholl, you can give them new life. Although the directions say cut the inserts down to your size, don’t cut them. 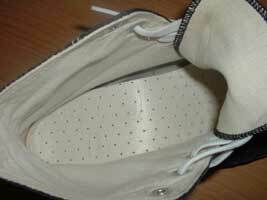 The overlap will help stabilize them inside the shoe, and make it more difficult for the insert to move around. If they do move around, be sure to adjust them back after wearing the first couple of times to make sure they cover all of the old inner sole and set in place correctly. In extreme cases of deterioration, you may need to put a second insert in each shoe to make sure the deteriorated insoles are completely covered. 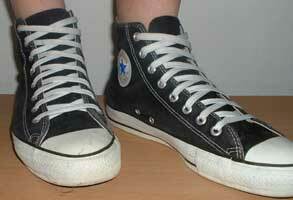 A redone pair of chucks with new insoles are especially comfortable to wear without socks. The outsoles and canvas uppers are already broken in to fit you fit, and the new insole gives your foot new comfort. These redone chucks are great to wear without socks. Although most chucks wearers never clean their chucks, sometimes a little clean up will make them look better. You can clean the outer foxing with most household cleaners, or for really soiled shoes, use a solution of 1/4 cup bleach with a gallon of water. (Be very careful if you use bleach to not let it get on the canvas uppers.) The best thing we have found is a specialty product, Star Cleaner for Chucks. See the article about this product and more cleaning tips. Star Cleaner is especially good at restoring your toe caps so they look new again. For stubborn stains, use a stiff brush. If there is any mildew or mold, or a really bad smell, you can soak them for a while in the solution. Deodorizing products like Febreze also will help make them pleasant to wear. Spray the insoles with the deordorizing solution and let them dry. The cleaning process will also give new life and color to your canvas uppers; just be careful not to overdo the bleach or cleaning solutions. When finished cleaning, make sure that the shoes are allowed to dry completely before you try to wear them. Do this out in the fresh air, don’t put them in a clothes dryer. If odors or mildew still persist, reclean the shoes one more time. 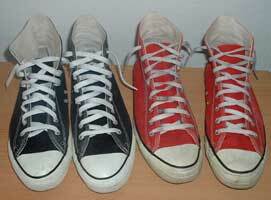 If your chucks have leather uppers, purchase a leather cleaning product appropriate for the color of your shoes. Be sure to follow the manufacturers directions, and if there is any question about whether the product is suitable for your chucks, try testing it on a small portion of the leather uppers before applying to the entire shoe. Many cleaning products also have emolients that help preserve the leather and help it maintain its flexibility. If you have a pair of leather chucks you really like, you can keep looking great for many years with a little care. These leather chucks will look better after a cleaning of the rubber foxing. Because chucks are shoes and the rubber flexes and bends during wear, tears can be difficult to repair. Super glues aren’t going to work because the seal isn’t flexible, and so you want to use a glue that creates a permanent but flexible seal. Get an adhesive like Industrial Strength E6000 (Eclectic Products, Inc.) and follow the directions carefully. You have to prepare the tear carefully, figure out a way to hold or clamp the pieces together, and be sure to allow a drying time of up to 72 hours (follow the directions on the package or tube). Another easy way to give your chucks new life is to change the shoe laces.Whether you go with classic flat, wide, narrow, neon, rainbow, basic white, or one of many colors that are now available, new laces will give your chucks a distinctive look. These old black high tops look great with a new pair of classic white laces.